Okay, "Home Board" is a dumb name, but I don't know what else to call it. Now that we have that out of the way, let's talk about this cool thing I built. 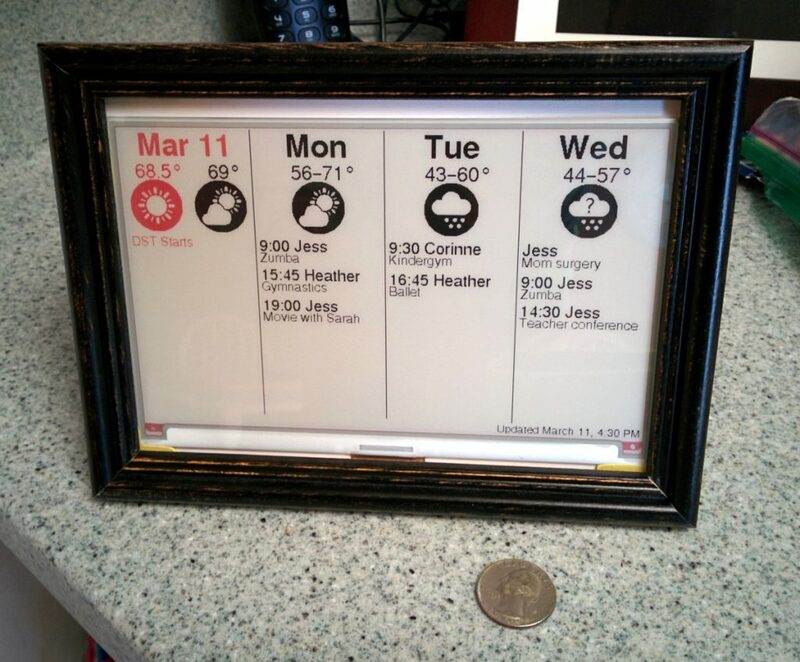 This is a 7.5" e-ink display mounted inside a picture frame. It's hooked up to a Raspberry Pi and updates the weather and calendar information every 15 minutes. During "special events" it displays an additional celebration message (see example below). This is a product I've wanted for a long time, but no one made such a thing as far as I could find. So I finally decided to make it myself. As you can see, the back is a bit of a mess; but it's all attached, so you only have to run the power cord. It would be cleaner if I were using a newer Raspberry Pi. The display comes with a "hat" (zip-tied to the frame stand in this picture) that fits directly on the GPIO pins of the newer Raspberry Pi. It doesn't fit on the version 1 (which I'm using here), so I had to use the provided multi-colored wires and connect the pins myself. Also, the newer RPis use microSD cards that don't hang over the edge of the case (behind the power connectors). And they have built-in Wi-Fi so there'd be no additional dongle (the blue glow at the bottom). The 7.5" screen was the largest e-ink display I could find. Someone used to make a 10.2" one, but it appears to be discontinued. The refresh rate is terrible (about 15 seconds to change images, with lots of flashing throughout). But for my purposes that's fine. I'm only updating it every 15 minutes. I wanted a e-ink display for 2 reasons. The first is that it doesn't glow, so being on all night isn't annoying. And the second is that it's super low power. Power is only needed while updating the display. It pulls its power from the Raspberry Pi, which, at full draw, maxes out at ~2 watts. Which means, assuming some loss in the power adapter, is less than $5 a year (I'm pretty sure I did that math right). Waveshare 7.5 inch e-ink 3-color display with Raspberry Pi connector. 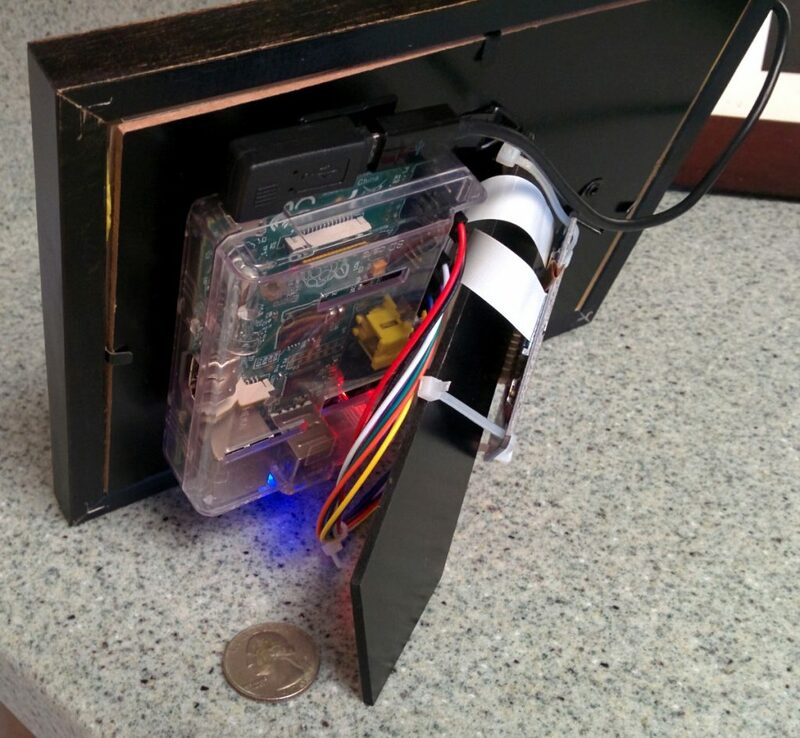 Raspberry Pi with case and power supply (I'm using a version 1, but the display works with 1, 2, or 3). The total cost of hardware is about $125 (display, RPi, SD card, case, power supply, cord, frame, mounting hardware). 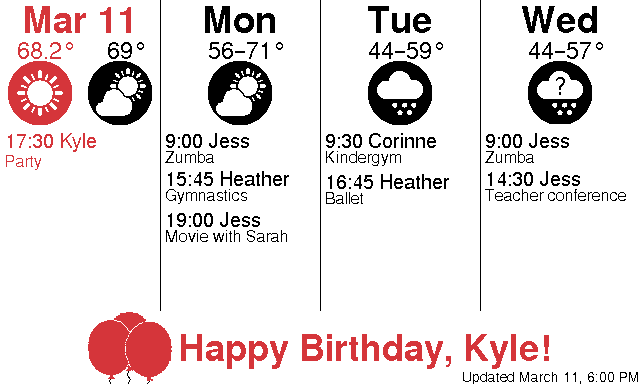 My custom written Python application that pulls the data together, generates the image, and sends it to the display. This is SO COOL!!!!! Awesome job!!! !